This is the second in a series of guest blog posts by Tom Wiseman, our Assistant Service Manager and Bicycle Fit Specialist at Century Cycles in Medina. In the first post, Tom had the story, photos, and videos of his bucket list trip of bicycling up and down Pike's Peak. The report below is from the main purpose of his Colorado visit. 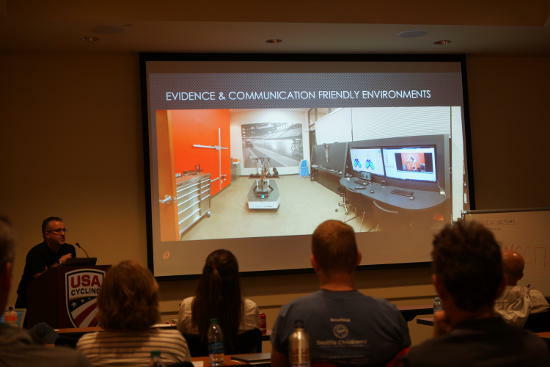 The Eighth Annual Medicine of Cycling Conference (MOCC) was recently held at USA Cycling headquarters in Colorado Springs, CO August 18-20, 2017. The conference is presented by the University of California, San Francisco School of Medicine, and Medicine of Cycling in collaboration with USA Cycling. The purpose of the conference is to educate medical professionals and help them to provide better care for injured cyclists. These courses are valuable continuing education for all types of medical providers, including Physical Therapists, Doctors, and First Responders from all over the world. This year, people attended from 11 different countries. There are 3 different courses offered over the 3 day weekend. 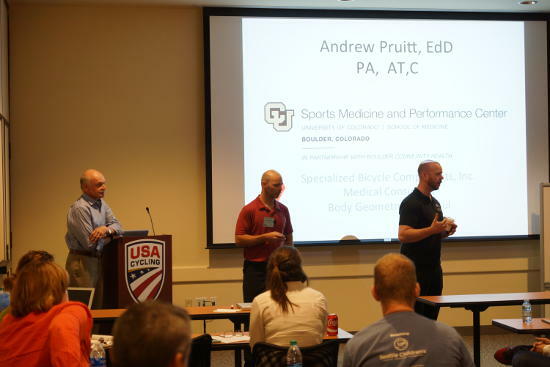 These include Medical Emergencies in Cycling Conference, The Medicine of Cycling Conference, and the Bike Fit Symposium. 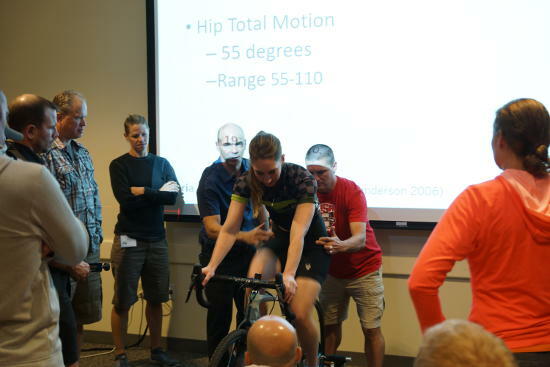 Being a bike fitter at Century Cycles, I chose to attend the Bike Fit Symposium portion of the Conference. Curtis Cramblett LPT CFMT, has worked with the Garmin Cervelo Pro race team as both a fitter and Physical Therapist. He is the Owner of Revolutions in Fitness in Palo Alto, California. 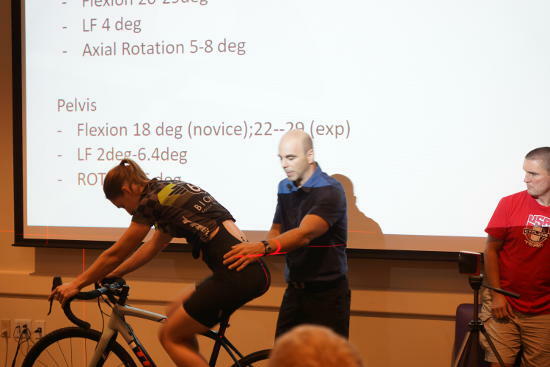 Kit Vogel MS DPT, Educator and Owner of BikeFit, has presented at various bike fit symposiums, including the International Cyclefit Symposium (ICS) in London (2012), SICI International Cycling Science Symposium in 2007 and 2008. Todd Carver, Chief Fit and Education officer at Retul in Boulder, Colorado. Andy Pruitt EdD is an internationally known athletic trainer, physician assistant, author, and the Director of the Colorado University Sports Medicine and Performance Center in Boulder, Colorado. Greg Robidoux PT, Owner and primary educator at Serotta International Cycling Institute (SICI). Paraic McGlynn, Founder and Chief Technologist at Cyclologic in Scottsdale, Arizona. Prior to founding Cyclologic, Paraic was instrumental in technology development at FASTER, the world’s first cycling-specific wind tunnel and retail center. 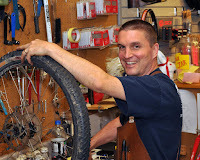 Michael Sylvester, Owner at Bicycle Fitting Services in Portland, Oregon. He has created fitting schools and curriculum for Trek, Raleigh, and Serotta. He has over 35 years experience fitting all types of riders, from Tour de France Professionals to commuters, and even former President George W. Bush on the White House lawn. Day one was a whirlwind of lecture topics, and a wonderful meet and greet of all the presenters and attendees. It was nice to put faces with the voices of people I have talked to on the phone and catch up with some old friends and instructors from past coursework I have taken. Sitting in a classroom setting for entire day taking information like it was coming from a fire hose was a little overwhelming. Subjects like biomechanics and anatomy were covered, as well as the importance of “evidence based fitting.” The discussion on normative values was interesting because of the sheer volume of data that was compiled to get to the average values we fitters often use to determine position for new riders or people with little experience and feedback. There was also a lengthy interaction about the differences between static and dynamic kinematics in cyclists. This was a comparison of static fitting using a goniometer/inclinometer and plumb line compared to 3 dimensional motion capture fitting systems, looking at the finish position of both methods. Ironically, both are effective for different situations for different reasons. Bottom line is the first day of fitting lecture was really informative and much more information than I could absorb in such a short time. Thankfully, all the notes and slides were supplied for us to look at later at our leisure. Day two was mostly hands-on biomechanics and assessment instruction. There was a short lecture at the start of the day covering Kinesiology Tape and its implications on fit and function. It was nice to see the science behind the product and real evidence of its successful application in the fitting environment. The primary focus of day two was to cover body assessment and compensation techniques used in fitting evaluation. Exercises like the Unilateral Bridge Endurance Test and the Functional Single Leg Squat were not only shown extensively, but we broke into groups and performed these tests multiple times to witness many different compensatory reactions of different people. Seeing the many people do the tests made it possible to see the ways each exercise can help identify issues with how or why they interact with the bike like they do. This was a very interactive and informative session and working closely with all the Physical Therapist and medical professionals was truly the most valuable portion of the whole weekend for me as a fitter. Everything from spine issues to neck and shoulder interventions to evaluations of how the foot works under load were covered in depth. Fascinating stuff, and again, so much more information than I could process in a single day. But the hands-on, practice-what-you-see approach was very helpful, indeed. This day closed with a group road ride through the Garden of the Gods Park. A beautiful day in the park with a head full of new fitting information. Day three was the application of the information we has been given over the previous two days. We used a “test subject” for our fitting, and applied the needed assessment techniques and practiced those things on an actual person, with much discussion of different possible approaches to the issues presented. It was really amazing to see different people talk about the ways they would deal with fitting the subject, and just how different each mind addressed the problems. There were both “on bike” and “off bike” intervention approaches to solving the issues we were presented. Some people wanted to work on flexibility and mobilization of the body, while others wanted to adjust the bike to accommodate the issues until the rider could improve the off the bike options in the weeks to come. The importance of testing each change for a favorable result was continually stressed as we moved from one change to the next. The realization that mechanical limitations in equipment is a very common hurdle to an ideal position was also experienced. These limitations made the possibility of an ideal fit unrealistic, and the decision to pursue an accommodated fitting was worked toward for the remainder of our time together for day three. Applying the information with the chance to ask questions and try different methods was a very rewarding experience for me as a fitter. The conference reinforced many of the things I practice in all of my fittings. It also gave me plenty of new things to practice and incorporate in my future practice as well. The continual reminder of the importance of gathering evidence, making changes and testing for a positive result before moving on to the next change was a very strong thread throughout the weekend. The idea that what works for some people might not be a solution for others was not only stressed but proven through the course of the conference. The information I gained over three days was more than many of the other fitting classes I have taken combined. Simply put, it was worth every penny, and I will have research and reading material for months to come. I am very glad to have been able to attend the Medicine of Cycling Conference and am planning to go back to Colorado next year.